From the Disney Very Important Princess Party Supply Collection. 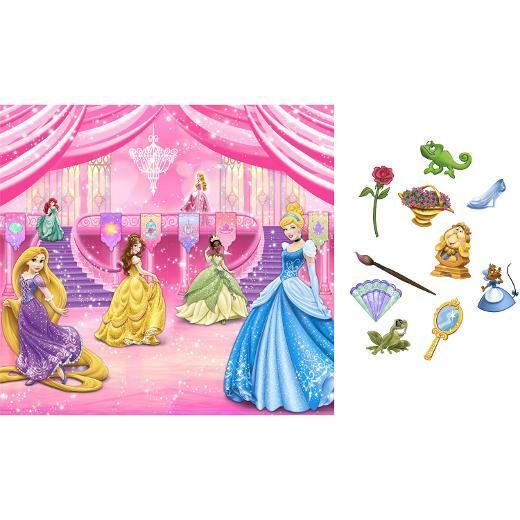 Disney Very Important Princess Dream Party Photo Backdrop and Props Kit. This fun photo backdrop features Rapunzel, Ariel, Belle, Tiana, Aurora and Cinderella gathered together in a royal pink ballroom. Kit includes a 67" x 72" party backdrop and 11 props to customize the backdrop. Props vary in size but are no larger than 10" x 13" high. 14 in. x .25 in. x 11 in.